The discovery of a Middle Eocene (48.6-37.2 million years ago) sea cow fossil by McGill University professor Karen Samonds has culminated in the naming of a new species. 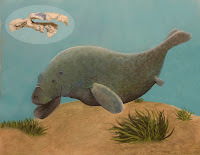 This primitive "dugong" is among the world's first fully-aquatic sea cows, having evolved from terrestrial herbivores that began exploiting coastal waters. Within this ancient genus, the newly discovered species is unusual as it is the first species known from the southern hemisphere (its closest relatives are from Egypt and India), and is extremely primitive in its skull morphology and dental adaptations. The fossil is a pivotal step in understanding Madagascar's evolutionary history - as it represents the first fossil mammal ever named from the 80-million-year gap in Madagascar's fossil record. "The fossils of this ancient sea cow are unique in that it has a full set of relatively unspecialized teeth whereas modern sea cows have a reduced dentition specialized for eating sea grass, and most fossil species already show some degree of reduction. It may also be the first fully aquatic sea cow; confirmation will depend on recovering more of the skeleton, especially its limbs," says Samonds. Samonds is a Curator at the Redpath Museum and an Assistant Professor in the Departments of Anatomy and Cell Biology, and the Faculty of Dentistry. Her discovery may be the tip of the iceberg to unlocking the secrets of 80-million-year gap in Madagascar's fossil record. The presence of fossil sea cows, crocodiles, and turtles, (which are generally associated with coastal environments), suggests that this fossil locality preserves an environment that was close to the coast, or even in an estuary (river mouth). These sediments may potentially yield fossils of marine, terrestrial and freshwater vertebrates - animals that lived in the sea as well as those that lived in forests, grasslands and rivers close to the ocean. Dr. Samonds plans to continue collecting fossils at this site, starting with a National Geographic-funded expedition in summer 2010. "My hope with the discovery of these fossils is that they will illuminate how, when and from where Madagascar's modern animals arrived," said Samonds, "helping us understand how Madagascar accumulated such a bizarre and unique set of modern animals."